Is there anything more perfect than when sweet and salty have a baby? 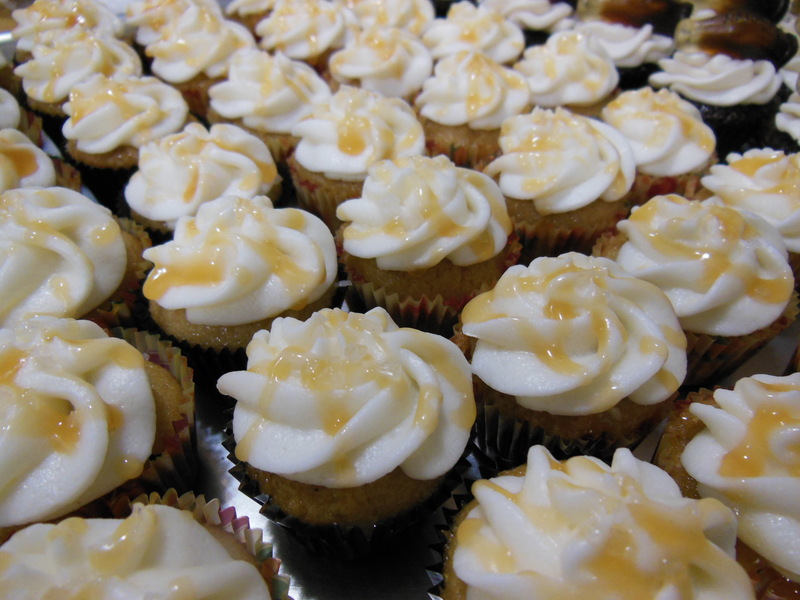 I mean, I will go on record saying I have had kettle corn for breakfast, lunch and dinner, but I digress… SALTED CARAMEL CUPCAKES, YAY! This wonderful recipe comes from Cupcakes: Luscious bakeshop favourites from your home by Shelly Kaldunski. I didn’t alter the cupcake recipe one bit (except that I made minis and altered the time accordingly) but I did use my own butter cream. Position a rack in the middle of the oven and preheat to 350 degrees. Line a standard 12-cup muffin pan with paper or foil liners.in a bowl, whisk together flour, baking powder and salt. In another bowl, using an electric mixer on medium-high speed, beat the sugars and butter together until light and fluffy, 2-3 minutes. add the eggs and vanilla, and beat until combined. add flour mixture in 3 additions, alternating with the milk in 2 additions, beating on low speed until just combined; scrape down the sides of the bowl as needed. Divide the batter evenly among the prepared muffin cups, filling each about two-thirds full. Bake until a toothpick inserted in the center of a cupcake comes our clean, 18-20 minutes. Let the cupcakes cool in the pan on a wire rack for 5 minutes. Transfer the cupcakes to the wire rack and let cool completely, about 1 hour. Frost with your choice of vanilla butter cream*, drizzle with caramel sauce and sprinkle with a pinch of coarse sea salt. * I pretty much use the same butter cream for all my recipes unless specified. Am I “unprofessional” for not including it with every post that requires a butter cream?